Boeing P-12Bs of Kelly Field's 43rd School Squadron are seen in a Texas farmer's field during 1932 "strange field landing practice". A required part of the Air Corps Advance Flying School training syllabus of those days, the students had selected the field as they "cut" their engines on a hand signal from their instructor who has landed behind them and awaits their take-off. This could prove a dangerous position as farmers often defended their property with shotguns. 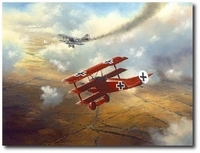 Instructing in aircraft #2 is the artist's father, Lt. Carlisle I. Ferris. Keith Ferris formed his love of aircraft as a child while living within 100 feet of those P-12s at Kelly Field.